Available only in intrastate commerce within the state of Maryland! Those of you who love to write and receive letters, cards, etc., will appreciate the beauty and utility of our heirloom Whale Tooth Letter Opener. The stainless blade is made with three laminations of steel - The center of the 2 3/4 inch long blade is a hard steel that will keep its sharp edge for a very long time. The sides of the blade are made from a slightly softer steel so that, when the blade ultimately needs sharpening, it will sharpen quickly and easily. The bolster is made from nickel silver. 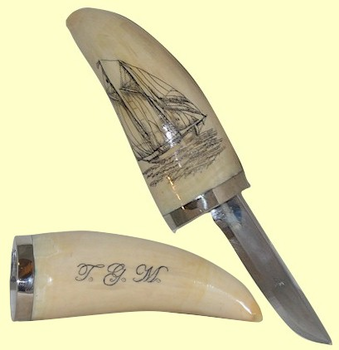 A design similar to the sailors' knives you've seen in many maritime museums - The handle is made from a legal Sperm Whales tooth registered with Department of Commerce. The tooth measures approximately 4 1/2 inches around its outer edge. It will fit your right hand perfectly. Choose your hand-etched design from the designs shown below, or, as an additional option, have us etch a picture of your own boat or pet on this great knife. (Note that muzzle loaders love this period piece and actually use it as a patch knife.) We will also personalize your letter opener with your name, initials or your boat's name at no extra charge. Just imagine how much you will love using this nautical treasure and seeing how well it adorns your desk. Hand made in our studio. Comes with soft zippered collector's storage pouch.